This paper describes an algorithm for automatically adapting existing simulated behaviors to new characters. Animating a new character is difficult because a control system tuned for one character will not, in general,work on a characterwith different limb lengths, masses, or moments of inertia. The algorithm presented here adapts the control system to a new character in two stages. First, the control system parameters are scaled based on the sizes, masses, and moments of inertia of the new and the original characters. Then a subset of the parameters is fine-tuned using a search process based on simulated annealing. To demonstrate the effectiveness of this approach, we animate the running motion of a woman, child, and imaginary character bymodifying the control systemfor a man. We also animate the bicycling motion of a second imaginary character by modifying the control system for a man. 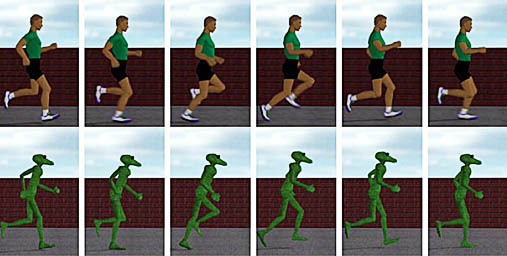 We evaluate the results of this approach by comparing the motion of the simulated human runnerswith video of an actual child andwith data for men,women, and children in the literature. In addition to adapting a control system for a new model, this approach can also be used to adapt the control system in an on-line fashion to produce a physically realistic metamorphosis from the original to the new model while the morphing character is performing the behavior. We demonstrate this on-line adaptation with a morph from a man to a woman over a period of twenty seconds. Jessica K. Hodgins, Nancy S. Pollard (1997). Adapting Simulated Behaviors For New Characters. Proceedings of SIGGRAPH 97, 153--162.